The previous articles (part 1 and part 2) described the different parts of the resolution control panel in SilverFast, how to use the resolution slider and the “Q-Factor and Screen” values. The previous two options can be used individually (as explained in each article) for different purposes, either archiving or with printing in mind. Imagine you simply want to save your pictures for a Tv screen, a DVD presentation, the internet, or a projection. If that is the case, you probably will not need to scan at the maximal scanner resolution because it will generate huge files, which will not necessarily match your desired format and will take ages to load. That is when the real power of this panel section come in handy. In other words, mastering the input- output as well as the scale values will give you greater precision control over the size of your pictures as well as unleash more possibilities for the two previous parts of the panel. It is important to set the right measurement unit for your output so your pictures get the right size. By clicking the measurement unit button, the unit will change: inches, cm, pica, point, pixel and back to inches. This is the first thing you have to adjust according to your goals. Say you want to scan for screening your pictures on a tv with a resolution measured in pixels. In this case it is best to set the units in pixels. If you want to print your pictures, then it is best to set the unit to inches or centimeters. Generally speaking, you will find two fields for every value (one above the other). The one above is to specify the horizontal value and the one below for the vertical value. 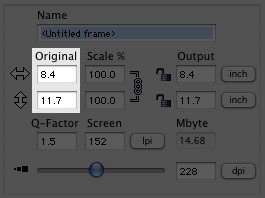 The original value determines the size of the scan frame, if you want to scan a very specific size of your original, you should use the numeric keys to input horizontal and vertical values here. Normally it is best (and easier) not to input any values here. Instead, drag the corners of the red scanning frame on the preview window to adjust the size of the area to be scanned. The scale value (next graphic) determines the enlargement or reduction ratio of the original material expressed in percentage, regularly horizontal and vertical value ratios are locked. Should you change any of these values, the other must automatically change to match the same enlargement value ratio. Clicking the chain will unlock the scaling aspect ratio allowing a non-proportional scaling, you will of course have to enter the respective values with the numbers on your keyboard. 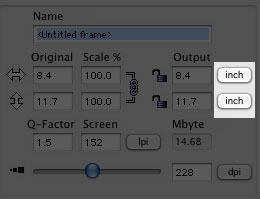 The Output value displays the size of the resulting picture expressed in the measurement unit you have selected at the beginning (note, this value is the size of the image and not the file size in terms of bytes). Two locks are located to the left of the output value fields. Since the original goal is to scan to a determined output size, you can input the desired horizontal and vertical size values for the resulting picture and then close the locks to prevent any accidental change from happening. Warning: If you change any of the scale ratio or original values, the output value will immediately change. 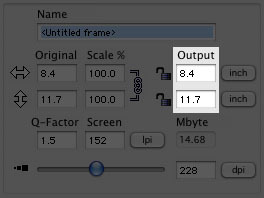 This is also true for the scale percent if you change the output value. The scanning frame remains the size you have set by dragging its corners and the output size will remain if you close the locks. It means, there are certain values which have priority over other values, you should not try to adjust every single field in the resolution panel because they interact and affect each other. 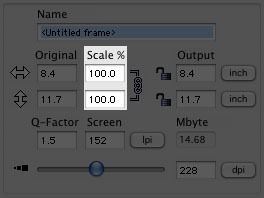 If you determine the area to be scanned (scanning frame) and lock the output values, the scale percentage will be automatically locked, however if you move the resolution slider, probably the screen factor will change to accommodate to this picture size (again this is relevant for people who work with screens in the professional printing area) or the other way around. On the other hand if you want to scan a picture to be printed at a specific size using a printing resolution of (say) 300 dpi , you can set the scanning frame, and the output value (without locking the output values) and then move the resolution slider. SilverFast will automatically set the optimal scanning resolution for this job. In conclusion, if you are interested in archiving your pictures, you should use only the resolution slider and leave all other options in the resolution panel alone. 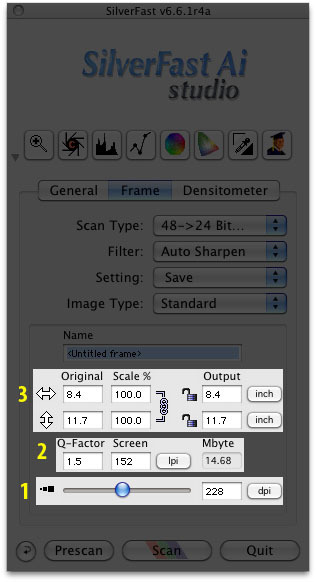 If you are interested in a specific printing screen value for your publisher or if you work in the printing industry and need your pictures to have the optimal values for this job, then use the Q-factor and screen values in combination either with the resolution slider or the input-output values (but not all at the same time). But if your goal is to digitize your picture with some specific resulting size in mind, then use the input-output parameters or combine these with the resolution slider if you wish to print at home at a specific size and printing resolution. Good explanation, but the question becomes what output resolution should I choose for color slides when my possible uses would be 4×6″, 8×10″, or 12×14″ photos, mostly 4×6:, and digital files that will look good on a HD TV 1920×1080 pixels. Also comment on the possible quad HD where there would be 4 times the resolution for the TV. Hi, I am still confused as to the output and dpi. I am scanning a 3 inch image that will be used for print and scaled up about 4 times this size. do I enter the value of the final output and slide the resolution to 600 dpi or higher? I am also using the same image (3 inches) that will be in an animation and projected onto a wall/movie theatre screen and or computer screen. what would I put as the final output or resolution? The silverfast does not seem to like scanning at high res also… any suggestions would be great. What is the maximum output size? only A4 (21 x 29,7)? A4 is the largest preset output format with SilverFast 8. However, you may manually enter any output size you need, if you select “Custom” as output format. Output size is only limited by your scanner’s optical resolution.